How a Hollywood costume designer and stylist used Capture Pro to make a great, branded website. Genevieve Tyrrell is an accomplished Hollywood costume designer and stylist who wanted a powerful website. She downloaded the Capture theme and then upgraded to the pro version for the support and extra features. This Case Study is going to show you how Genevieve took her website and modified it to make a website all her own. Step by step! If you need to learn how to install a theme prior to setting it up, we have a resource to read here. Design of a website typically starts with identification of the brand and color palette. Using the Capture Pro theme, Genevieve was able to modify the visual content of the website. Design starts with the top of the page and main inspiration for a website — the logo. The logo replaces the WordPress “site title” at the top of the page. It is the first thing viewers are going to see, so you want it to make a splash. To set up the logo, with our theme installed go to Appearance > Theme Options. The “General” tab will be open and you will see a space to upload your logo from your computer’s hard drive. Once uploaded, you will Save Changes at the bottom of the General page. For Capture, the recommended logo is 600 pixels wide by 180 pixels tall and would be a PNG with a translucent background (in case you decide to change the background color). On that note, the other element that can bring visual punch to a website is a strong background. Background images, when handled correctly, can spice up a website and add some pizazz. Genevieve went to the WordPress Customizer, found by logging in to WordPress and going to Appearance > Customize. 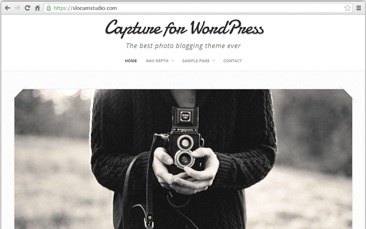 Capture Pro is a WordPress theme which works with the customizer, so she can upload her background image by selecting her image from her computer and uploading directly under the “Background” tab. Play with the tiling and choose a repeating texture so that tiling looks natural. If you are using a large image — like a landscape — make sure it is large enough to fit on larger desktop displays without tiling. Looking for a good background texture? You don’t have to steal Genevieve’s background (please don’t)! Subtle Patterns is a really cool website that has an array of cool background textures. One of the most attractive features to a costume designer or stylist should be visuals. If you work in a visual media and want to sell yourself, visuals are a must! Many studies have found that video is the best form of visual media for selling content. In the Hollywood space, it makes even more sense. 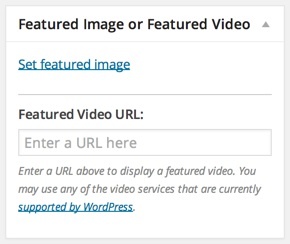 Capture Pro has a section for a Featured HD Video, which takes the place of the WordPress featured image if chosen. STEP 1: Upload or find your video on YouTube or Vimeo. STEP 2: Copy the URL or link of the video. STEP 3: Paste your link in to the Featured HD Video bar on the WordPress post or page you are editing. Once you publish your post, the Featured HD Video will display where a Featured Image would normally display. On Genevieve’s site, she shows trailers to movies she has done costume design for. Exposure to your costume design, through menus! After creating posts and pages using WordPress, Genevieve was ready to show her content on the navigation or menu bar. To show the content she wanted, we directed her to the Appearance > Menu section, where she added pages and posts that she had created to her menu and submenu. The next request she had was to make it so that Parent menu items (i.e. Film, Television) didn’t link anywhere. Our solution? Create a “Link” menu item. The link should go to #. Name the title whatever you would like to display on the menu bar for site visitors. Then, you can drag and drop sub-menu items underneath that menu item. It’s a cool trick and one that can be used in many cases and in many websites. A big way to connect with others and share your success is through social media. SEO specialists agree that one of the major tickets to getting attention to your website is through social channels. Perfect example. Genevieve reached out to us on Twitter, and we remembered her for it! Implementing social media in Capture Pro is easy. In the Theme Options area (where you go for many of the options that Capture Pro provides), there is a Social Media tab. Simply paste the url to your social media tab in the proper field and it will display on the mobile menu and side of your page. Genevieve did not want to show comments on her posts or pages. It was not necessary to allow people to comment on her work or trailers as the goal was simply to display them. We recommended the free Disable Comments plugin on the WordPress repository that allows you to disable comments on posts, pages, media, or all areas on your WordPress website. You can search: “Disable Comments” in Plugins > Add New when logged in to WordPress and install the plugin from there. Capture Pro is designed to showcase big photography and visual media. The proof is in the design. Any sidebars are at the bottom of the site and content areas / featured images are very large. Genevieve Tyrrell wanted to remove the post date and author information from her website. In fact, a LOT of people wanted to remove that aspect of posts and pages. There are a lot of pieces of content that people and developers want to modify in CSS. We provide an easy area to modify that content. Genevieve was guided to our Custom Scripts and Styles tab (also conveniently located in the Theme Options section). Through this section, we provided a quick snippet of CSS code to hide this content. Using a $59 WordPress template, Genevieve Tyrrell was able to make a special website that highlights her talents as a costume designer and stylist. 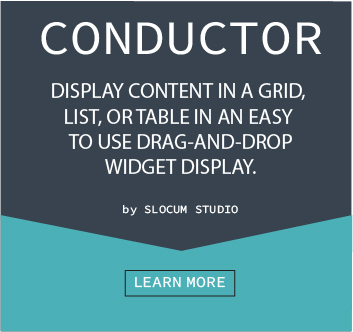 With access to loads of customization options, featured high-definition video and support from the team at Slocum Themes, she now has a website that is ready to grab attention. Thanks for using Slocum Themes, Genevieve! Genevieve set up her WordPress theme in only a couple of days for $59. Find out how you can make the most of your costume designer website using Capture Pro. Previous Post The Five Second Elevator Pitch – Choose the Right Website Layout.